Energy independence, new jobs, and billions of dollars in potential revenue are all touted as virtues of expanding offshore drilling, as the current administration has proposed to do on virtually all US coastlines. Oil lobbyists and the politicians in their pockets have done everything in their power to convince the public that the benefits of drilling outweigh the costs. This is patently false. There are many holes to poke in their analysis. To begin with, the economic contributions of offshore drilling pale in comparison to those of our vibrant coastal economies. Ocean-based industries, which include fishing, tourism, recreation, and hospitality, account for a majority of the nation’s jobs (71%) and almost half of the nation’s GDP. California’s coastal hospitality industry alone brings in $98.8 billion every year, according to the National Ocean Economics Program — not to mention $18 billion from tourism and hundreds of millions from fishing. Compare those numbers the to the yearly revenue of $79 billion that the entirety of US gas and oil generates (as self-reported by the industry). Offshore drilling would represent only a negligible fraction of GDP. Furthermore, jobs that would be added in the offshore sector are risky and undesirable, and the lion’s share of profits would go to top executives. It’s clear that coastal economies are vastly more important contributors, but are the two really incompatible? How likely is it that drilling would pose a serious threat? The answer is somewhere between extremely likely and inevitable. 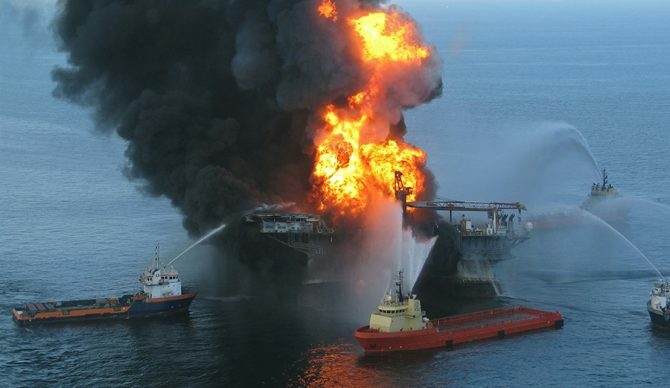 The flaws that led to major spills like the Deepwater Horizon disaster, which claimed 11 human lives and caused unfathomable destruction, have not been remedied. Extensive, government-ordered investigations led several independent commissions to the same conclusion: safety regulations are severely lacking in offshore oil and gas development. In response to these reports, the Center for Offshore Safety was created by none other than API, a group of oil lobbyists. This has allowed the industry to play by their own rules and resist standardized safety measures, citing the high costs of implementation. Since the BP disaster, workers have continued dying on the job and oil has continued to gush into the sea. Explosions, major leaks, and accidents are ubiquitous. According to the CDC, the fatality rate for offshore contract workers is more than seven times that of the national average. The CDC reports that these deaths could be prevented with more stringent safety guidelines. Moreover, the industry has failed to improve environmental standards. An estimated 880,000 gallons of oil are leaked by US drilling operations each year. This pollution harms and kills vital marine life, as does the seismic blasting required for construction of drilling rigs. We cannot trust the oil industry with our most precious resource. Offshore drilling is dangerous, irresponsible, and bad for the economy. That’s why hundreds of thousands of businesses and alliances all over the country have voiced their opposition. Secretary Zinke, who is spearheading Trump’s offshore oil and gas expansion program, seems to be aware of this reality. He agreed to exempt Florida from new drilling, stating that “Florida is unique and its coasts are heavily reliant on tourism as an economic driver.” In fact, Florida is not unique at all in that sense; the same goes for all coastal states. If you don’t think your state should have to accept the risks that were deemed too costly for Florida, this is your chance to say no. Your public officials are supposed to represent your interests, and it’s up to you to hold them accountable. There are many ways to do so: call, write, or show up in person to surf and march in Huntington Beach on May 6. It’s time to invest in clean energy, clean oceans, and a more sustainable economic future.